Do you guys remember a few years back when Doritos decided to take the gimmick approach with their mystery X-13D chips? They even made a big contest of who could figure out and name the new flavor. One day while driving to work in the morning I stopped off at a bagel place, saw a bag and picked them up. It took me a few chips, but soon enough I realized that I was eating cheeseburger chips with additional ketchup and mustard flavorings in there. It was a fun little mystery especially because most of the people I knew hadn’t tried them or seen the mystery chips around, but soon enough they disappeared from the bagel shop and I forgot about them. Until tonight that is. 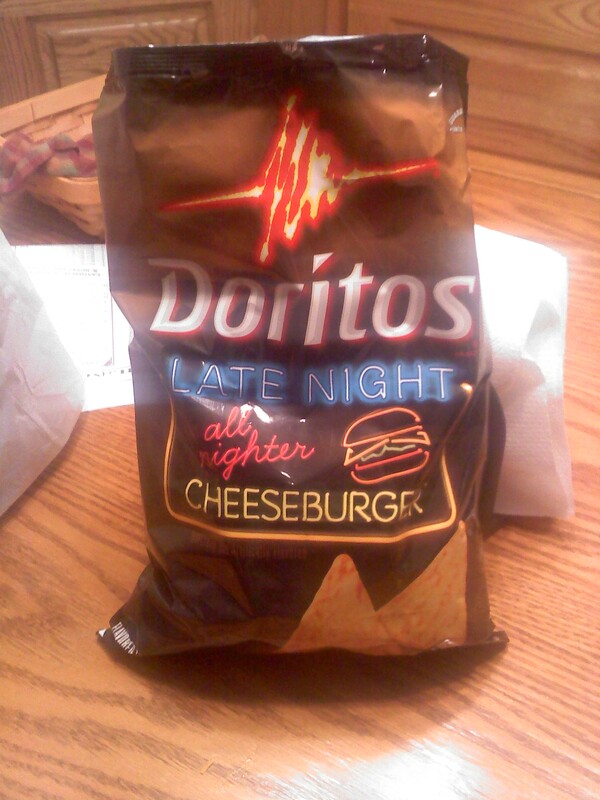 The missus and I ran out to the grocery store before the Super Bowl to grab a few snacks and some beer and lo and behold, sitting there on the shelves were the (I’m guessing) brand new Late Night All Nighter Cheeseburger chips. From what I remember, they’re the same chips and I still like them. Unlike the Enchilada and Sour Cream chips, which I kept hoping were a different flavor, I enjoyed how different the Cheeseburger chips are. If I had to make a choice to only eat one kind of Dorito for the rest of my life, I’d still have to go with Cool Ranch, but as I don’t see that snack apocalypse happening anytime soon, there’s plenty of room for different chips in my life, I’ll keep these in semi regular rotation.